I returned form my hols on Friday and as a warm night was predicted with a little bit of cloud cover, I setup the trap ready for darkness to come. 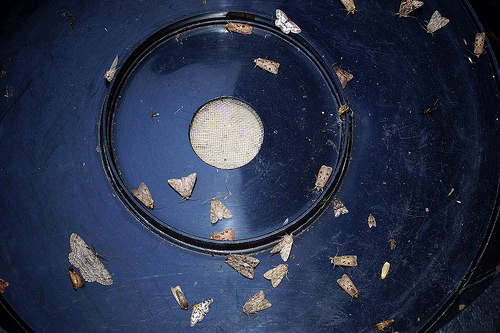 By the morning the trap was quite full and there was plenty of interest. The temperature didn’t get much below 15 degrees all night despite a clear start to the day at 5am on Saturday morning. It was great to see Lime Hawk-moth again after a 3 year absense in my garden, this use to be one of my commonest Hawk-moths where I use to live and i’d regularly trap 8-10 a year, and this is only my second ever garden example in 5 years of trapping here. Also the micro moth Rhyacionia pinivorana returned after 3 years as well. That now brings me up to 13 new species for the garden this year so far which is pretty good considering i’ve been trapping regularly here for 5 years and have a healthy 592 species recorded in that time period.